A recent purchase by the curator. 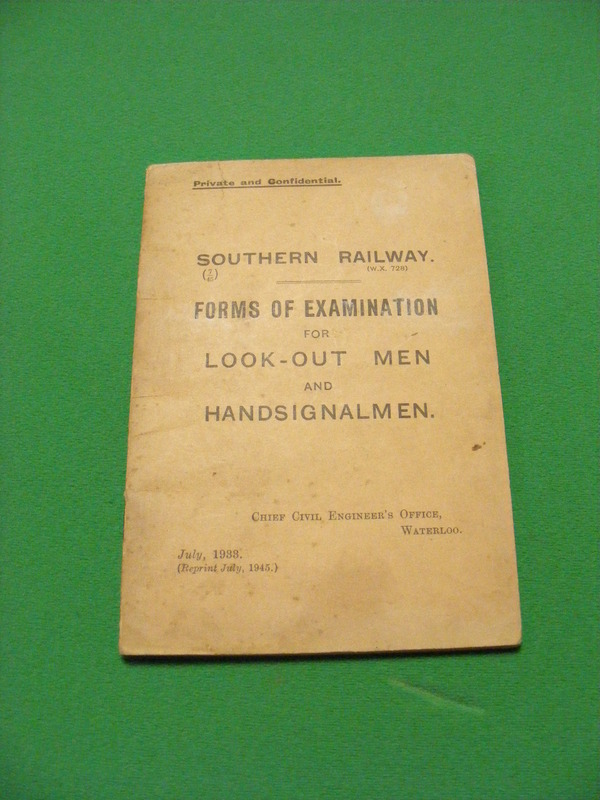 The later years of the 19th century saw increasing standardization on the railways, not least in the armbands worn by three types of railway worker – pilotmen, flagmen and lookout men. 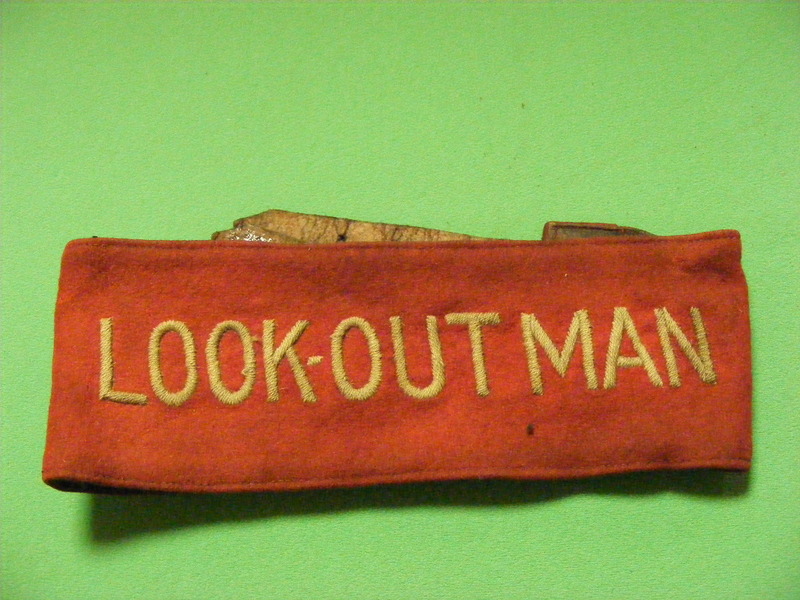 The one worn by pilotmen was issued by the signal department and was made of red cloth with white stitched letters, and was secured by leather or elastic straps. The armbands for flagmen and lookout men were made of enamelled steel plate, cut into an oval and shaped to fit the arm. A pair of slots was cut into the plate, through which a pair of leather straps, with buckles, was attached. 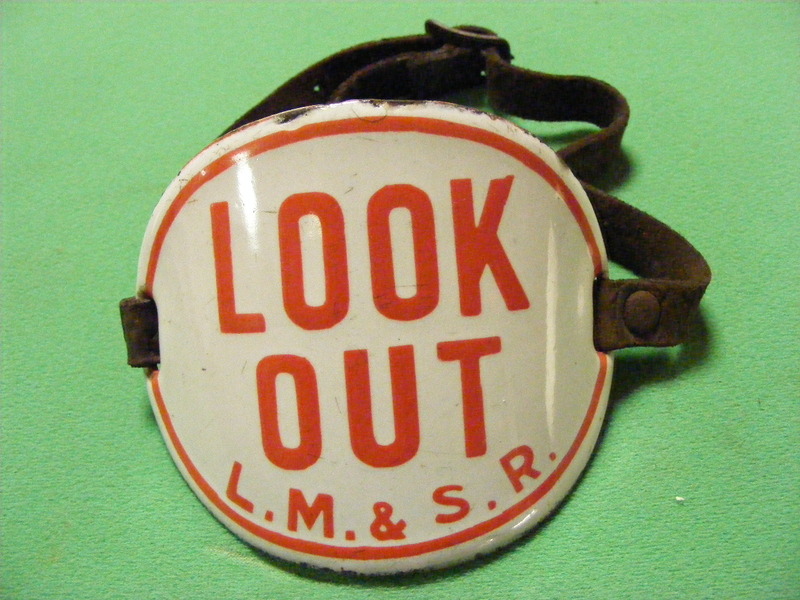 Issued by the permanent way department, these enamel armbands were finished in white with red lettering. A pilotman was a signal department employee whose job was to ride on the locomotive acting as a kind of human staff or token if the signalling on a single line failed, or if there was an accident or obstruction which closed one of the lines of a double track. No train could proceed without him in such an emergency, so that the possibility of a head-on collision was avoided. 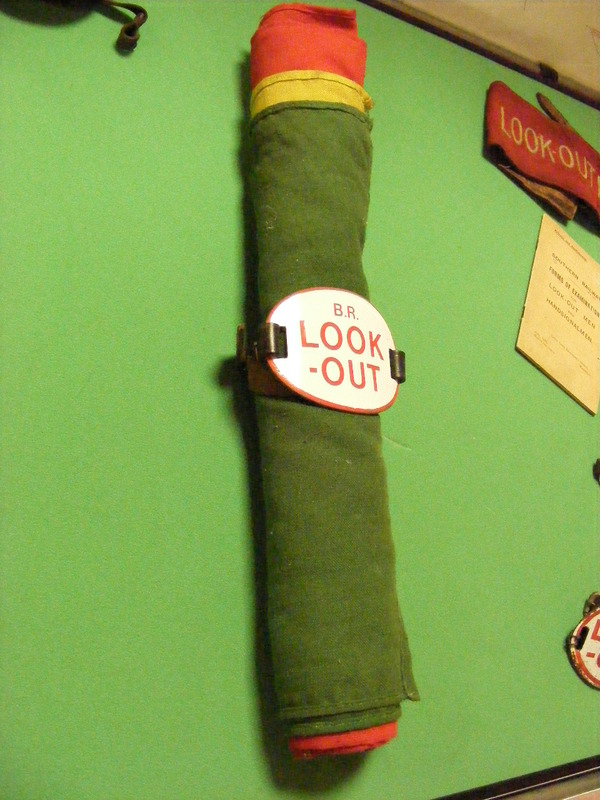 The lookout man was quite simply that. His job was to keep a sharp lookout when a permanent way gang was working on the track, and to give a warning for it to stand clear as soon as he saw an approaching train. 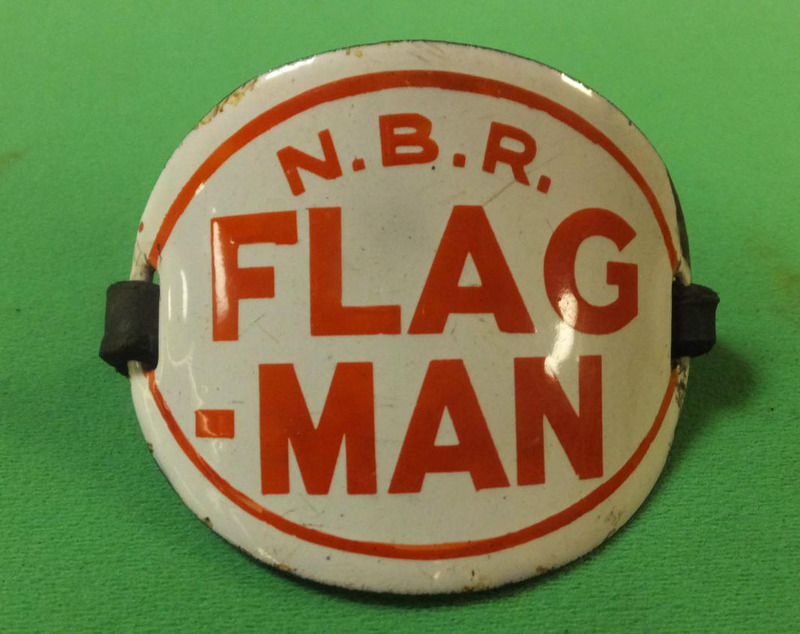 The flagman was another permanent way ganger, who used green, yellow or red flags to communicate with signalmen or other permanent way staff who were out of audible range. All three posts were – and still are – crucial to the safety of both passengers and railway employees, and armbands were issued to emphasize this fact and to avoid misunderstandings. A modern variety, coloured pale blue with white letters, was used on British Rail. London, Midland & Scottish Railway Armband. This armband is still my favourite. 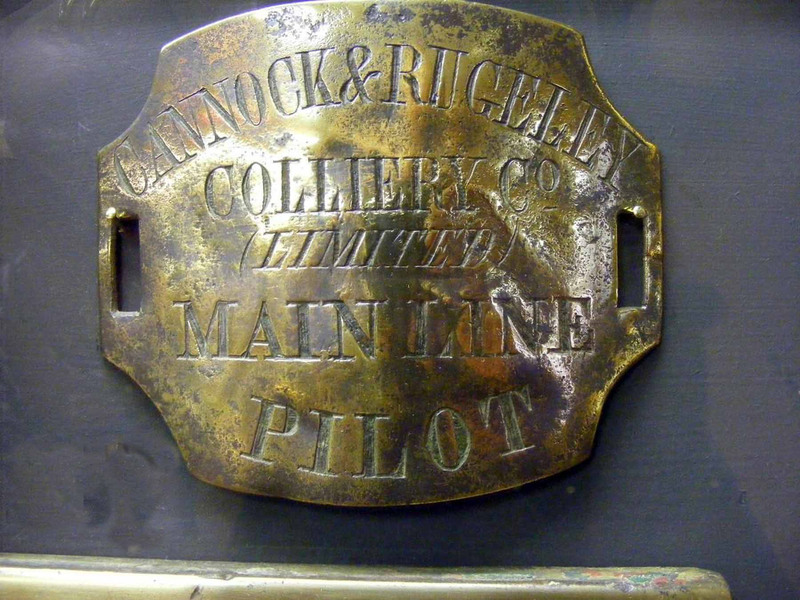 A brass Cannock & Rugeley Colliery Main Line Pilot Armband, dug up in a field by a farmer while ploughing some years ago – considerably battered and bent over double! This entry was posted in Museum Exhibits and tagged Aldridge, Armband, Bloxwich, Brownhills, Burntwood, Cannock, Cannock & Rugeley Colliery, Cannock Wood, Chasewater Railway Museum, Cheslyn Hay, CRC, Great Wyrley, Hazel Slade, Heath Hayes, Hednesford, Lichfield, Mining Heritage, Norton Canes, Old Railway Lines, Pelsall, Walsall, Walsall Wood. Bookmark the permalink.